"Bloody hell, how much stuff have you got?" Dagmire exclaimed while I packed my Tau army away over curses about his Sister of Battle and their flamers and Faith. The sight of 24 Tau Stealth Suits nestled in their foam tray obviously worried him. That's 18 Tau Stealth Suits with 6 spare Stealth Suits armed with fusion blasters just incase the need should arise. 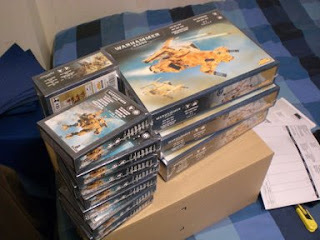 I thought it was time to totally unpack the case and have a look at exactly what I've got in my Tau army. That way I know what's yet to be built and painted, as well as all the stuff I need for the future. The Tau army looks quite impressive as it stands, but it needs more -so much more! I'm hoping for an Apocalypse game against James's Dark Angels army which comes to around 6,000pts. I don't think I'll have enough on my own, so I'd better rope a couple of local Tau players in to join forces against the Ravenwing, Deathwing and mechanised Space Marine armies under the Dark Angels banner. I have a few bits to paint here and there. I've also handed 3 Piranhas over to my comissioned painter. and that his only refreshment is Liche Purple. Lovingly stacked inside a spacious box are 4 Tau skyrays, 4 Tau battlesuits and 2 Forgeworld broadsides. The skyrays will become Devilfish with Smart Missile Systems. That allows me to mechanise all 4 Tau firewarrior teams. Then I'll flog the spare weapons on eBay to get some cash back. 3 of the Tau battlesuits with be armed with twin missile pod and flamer, then the last suit will be converted into my brand new Tau Commander with plasma rifle and missile pod. Obvious armament, but it works. So now it comes down to what else I want/need for the Tau army. Crisis battlesuits are top of the list, but I'd like to play some more games with my 3 different weapon configurations first. In some games the plasma rifle/missile pod combo has been awesome while in other games it has been overpriced and not very effective. Great for killing monstrous creatures though. So I'd like some more of them. The burst cannon/missile pod combo makes an interesting replacement for a squad of Stealth Suits, but I can't see the need for more than one of these teams. Twin fusion blaster is a little too close for my comfort, especially when railguns do the job perfectly well and from 72" away and the burst cannon/missile pods are cheaper and more versatile. I'm also planning a second Tau Commander, but this one will be armed with twin flamers and an airbursting fragmentation launcher to flush enemy troops out of cover. I think he could be awesome against outflanking units who come to steal my objectives and horde armies in general. That's all for now. I have some serious painting to do! Wow, you really like stealth suits, don't cha? I myself, have a thing for crisis suits (I have 12 w/various weapons). I used to just put the weapons on as I used the suits, but, that became a pain when playing multiple games at tournies and the weapons fall off on the floor or table while moving. So just this week I started gluing them on. Oh yeah, I like the plasma/ML combo also. My new toys are 3 with TL ML & shield gens. They work really well against all the ork buggies I play against. I find my plasma rifle/missile pod/t-array xv-8s always do well. Even if they only shoot the missile pods at range, wounding on 2+ helps to force those armor saves. I've never ran more than 4 XV-8s in a game though and oddly enough, I haven't really craved more than that; even at 2000 points. I also only like taking 4 stealth suits so it is surprising to see so many in your collection. Pretty cool if you can make them work though. Your army looks very nice all laid out like that. The real question I have is where are the kroot? You certainly have a lot of models to build. Have fun with those! The flamers are just a huge liability. You're never close enough or more importantly fast enough to make good use of them. And if you don't totally decimate the sorts of units that need 3 flame templates on them, you get ripped to peices. I'm currently wondering if burst cannon/missile pod suits are better for all round performance when they rack up just as many kills as the flamer suits, but with longer range and safer distance. 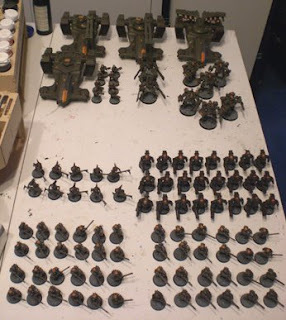 That picture of the entire army laid out is just more motivation for me to keep up the work on my own. It is so nice to see and army like that. It looks amazing.